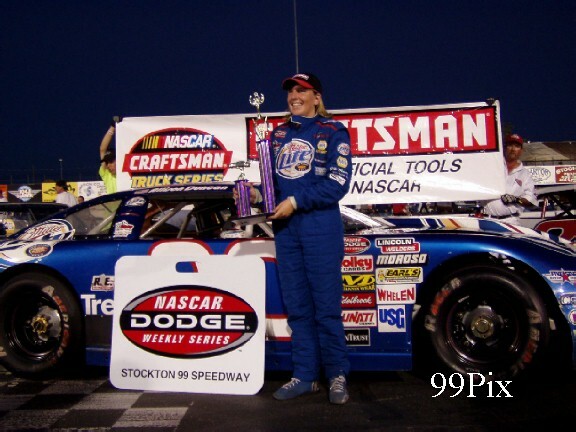 STOCKTON — San Rafael's Allison Duncan, #20, won her first Western Late Model race at Stockton 99 Speedway on Saturday, holding off teammate John Moore of Granite Bay in the 30-lap event. Duncan is a key figure in the Bill McAnally/Richard Childress Racing team as part of NASCAR's Drive For Diversity program. 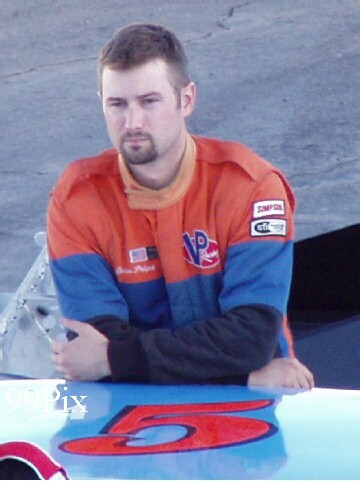 She entered the night second in points, five behind Stockton's #5,Pete Anderson Jr.
Duncan's night got easier after Anderson tangled with #11, Chris Monez on Lap 17. Turlock's Monez posted the fast time and won the trophy dash. But on Lap 10, he suffered two flat tires and a busted tie rod. Monez tried to return, but appeared to lose power and slowed down in front of Anderson. The cars collided, putting Monez out of the race and Anderson in the back of the field, where he was was unable to race for the lead. That left the door open for Duncan, who has been the runner-up four times this year. She started the race in the sixth spot. 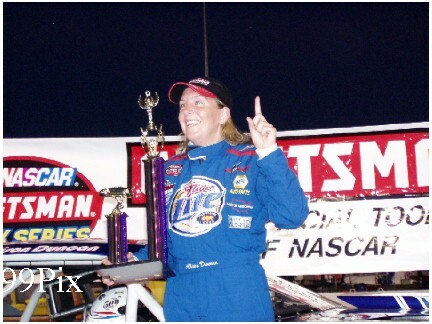 Duncan is the first female driver to win a feature race at Stockton 99 Speedway. 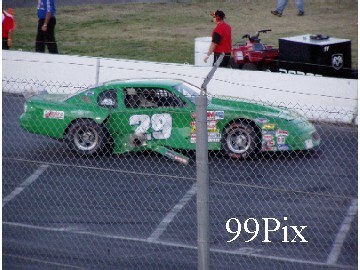 Escalon's Darrell Hughes, #28, was second to Stockton's Joe Allen, #1, who after dominating last week only to be nudged out at the line by #99 Donnie Darter last week, completely dominated this week and posted what looked like an easy win in the American Limited Stock Car division. 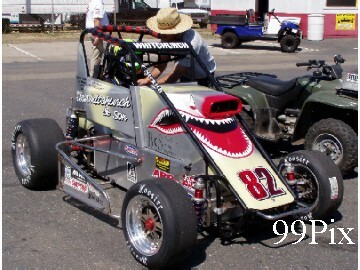 Top 3 in points driver #5, Rich Harper of Stockton, exited the main early with a blown transmission. ALSC Notes #1: #90, the third generation Manteca Missile, made his debut. The whole Strmiska family was there to see Ross Strmiska drive the family colored pink and black #90 for the first time. 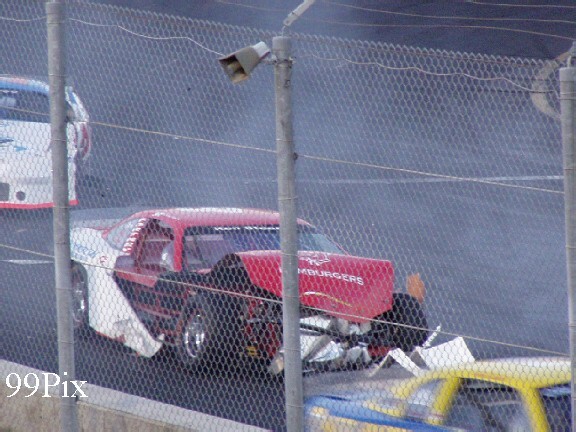 He made the main event and the car was basically unscratched at the end of the race!! ALSC Notes #2: Joe Allen drove to the front of the main with the autographed hood of approximately 1000 supporters of a Breast Cancer awareness drive. He was under a lot of pressure not to damage the special hood! 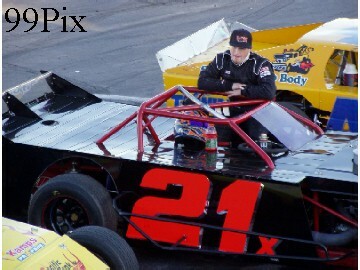 Modesto's #21, Kyle Gottula, (last week's winner), finished behind winner #5, Jason Philpot of Sacramento in the Grand American Modifieds 30-lap main event. 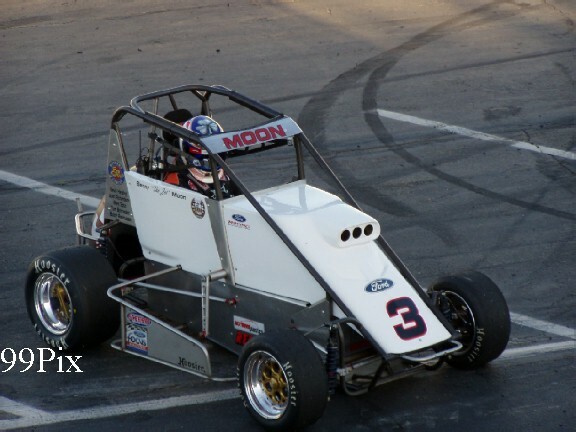 Benny Moon, #3, of Shingle Springs, Calif. halted #54, Alex Harris’ four-race winning streak in the USAC California Pavement Ford Focus Midgets Saturday night at the Stockton 99 Speedway. Moon was the last of four feature leaders, pacing the final six circuits in his Ron Sutton’s Winners Circle entry to beat #82, Robbie Whitchurch, #9, Jace Meier, Harris and #63, Cheis Veach. Other leaders were series point leader #17, Audra Sasselli, Harris and Whitchurch. 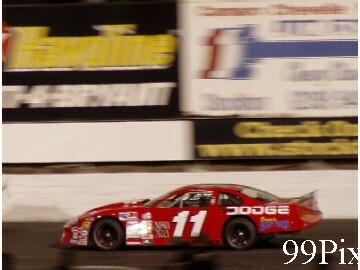 Chase Barber, #91, rolled down the front stretch. Barber was uninjured. 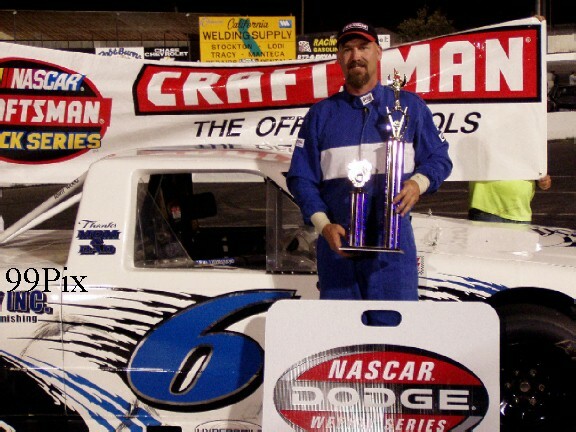 Mark Henslee, #6, of French Camp, held off #3, Ron Robeck of Milpitas to win the 25-lap Pro 4 Truck division's main event. 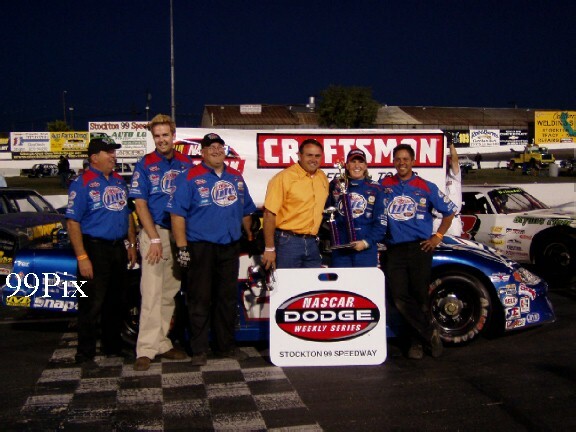 STOCKTON, SATURDAY, JUNE 11 -- San Rafael’s Allison Duncan won her first HAVOLINE Western Late Model main event Saturday night. 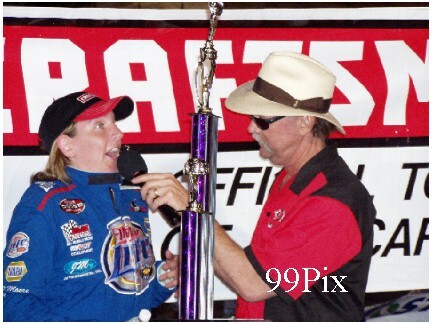 The first-year Stockton 99 Speedway driver -- known for her friendly smile and cool, calculating race style -- started the race in the sixth position. By lap-17 she had calmly maneuvered her way through several collisions, crept up on leader Pete Anderson, Jr., and then pulled ahead of him. "This is an awesome car," said an excited Duncan from victory lane. "We had some problems turning earlier, but they worked out." 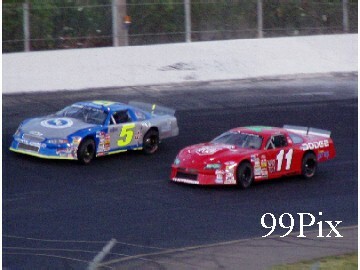 Stockton’s Pete Anderson, Jr., started the race in the second position, he quickly jumped into the lead in lap-1. By lap-5 Turlock’s Chris Monez, after posting the fast time and winning the dash, worked his way up from a fourth position start to second. In lap-10, on the back straight, Monez made a play for the lead with an outside move, before he could get past Anderson, Jr., he got pinched up against the wall, which left him with two flat front tires, a broken tie-rod and tow-ride to the infield pit. 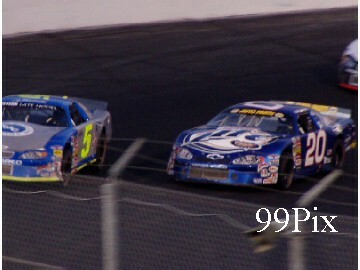 Duncan, who had worked her way up to third by then, was lined up side-by-side with Anderson, Jr., on the restart, the two battled for six more laps, then she took the lead. 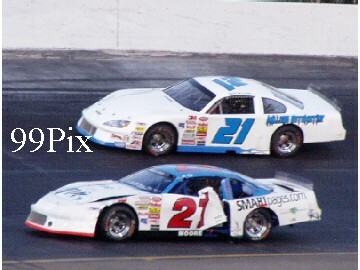 On lap-17 Monez re-entered the race, his car slowed heading into turn-1, Duncan managed to slide around him, but second place challenger Anderson, Jr., was not so lucky, he collided with Monez, drew caution and was sent to the back of the pack on the restart. 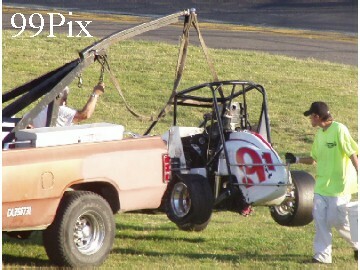 Monez then had his second tow of the night, he wouldn’t return. On the restart Duncan quickly regained the lead, which she held through to the end. 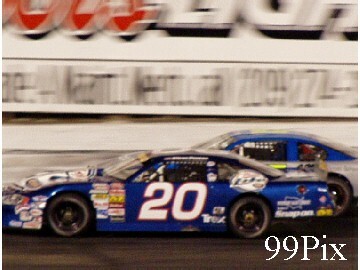 Anderson, Jr., was unable to make any challenge for the front. The win locked Duncan and Anderson, Jr., in a 386 to 386 WLM points tie. 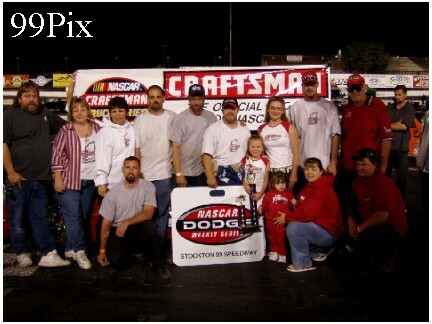 Duncan is now the first female driver to win a NASCAR DODGE Weekly Series Div. 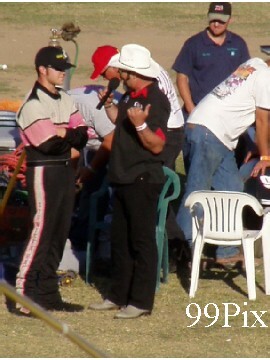 II Western Late Model main event at Stockton 99 Speedway. 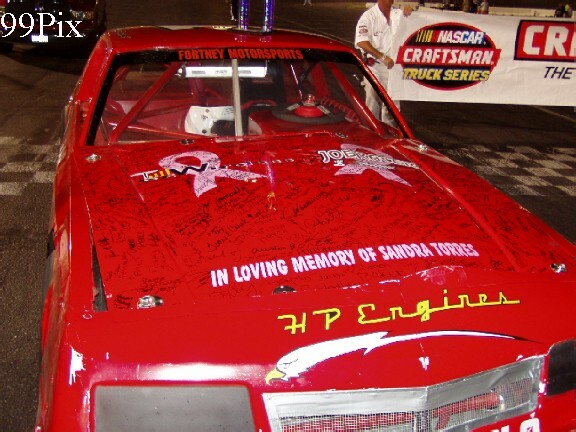 She was brought to Stockton 99 Speedway by Bill McAnally/Richard Childress racing as part of the NASCAR Drive for Diversity Program. Rounding out the WLM top five were Moore at second, Chowchilla’s Eric Humphries at third, Holeman at fourth and Lodi’s Arron Shankel at fifth. 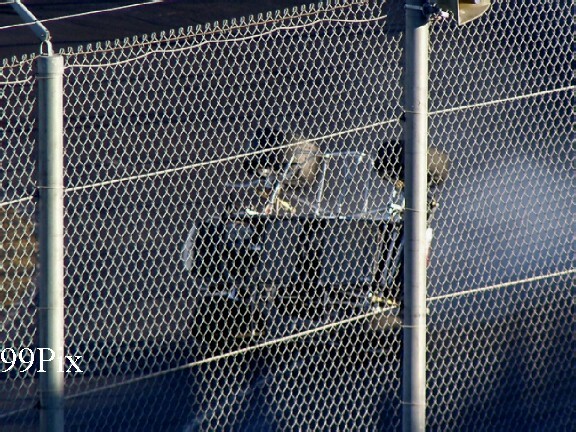 Western Late model racing wasn’t the only excitement at Stockton 99 Speedway Saturday night. 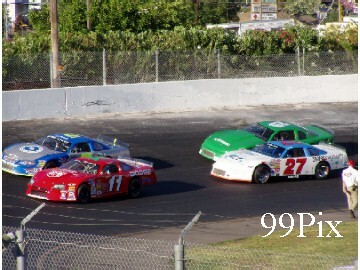 The CL BRYANT American Limited Stock Car drivers again put on an exciting show. 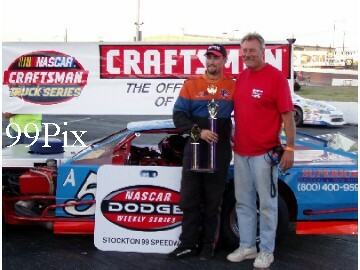 Last week Stockton’s Donny Darter wowed the crowd when he climbed out of an 11-cars-deep hole to win the first ALSC 50-lap race of the season. The crowd suspected that he might have been on his way to another win after winning the dash and capturing the fast time, but Stockton’s Joe Allen’s had other plans. 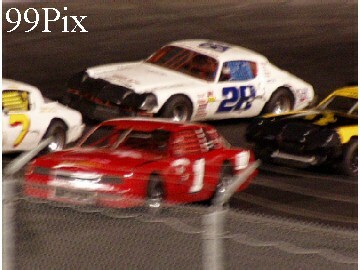 He started the race up front, quickly jumped into the lead and held it from wire to wire. Rounding out the top five were Escalon’s Darrell Hughes at second, Stockton’s Chad Holman at third, Modesto’s Charlie Clawson at fourth and Darter at fifth. 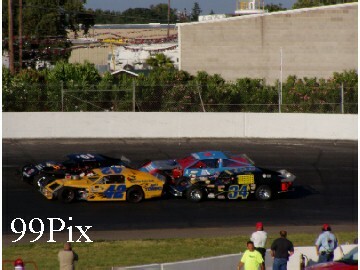 The Grand American Modified drivers were back for another 30-lap main event Saturday. Sacramento’s Jason Philpot led the race from start to finish, but the crowd deffinitly got its monies worth watching Newark’s Ted Montague IV, Citrus Heights’ Jay Linstroth and Modesto’s Kyle Gottula slug it out for second. Between laps 3 and the end, these three traded for second place a number of times, but by lap 20 Gotulla grabbed it and managed to hang onto it. Linstroth ended third, Dixon’s Jerry Duback finished fourth and Montague IV closed out the top five. The Pro-4 Trucks drivers were back in action Saturday. The night ended up belonging to Lathrop’s Mark Henslee. He jumped into the lead on the first lap and never let it go. 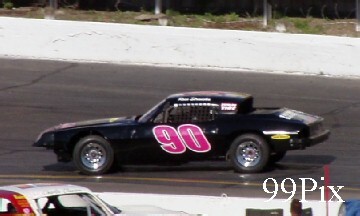 Ron Robeck (Milpitas) clocked the fast time and came in second in the main event. 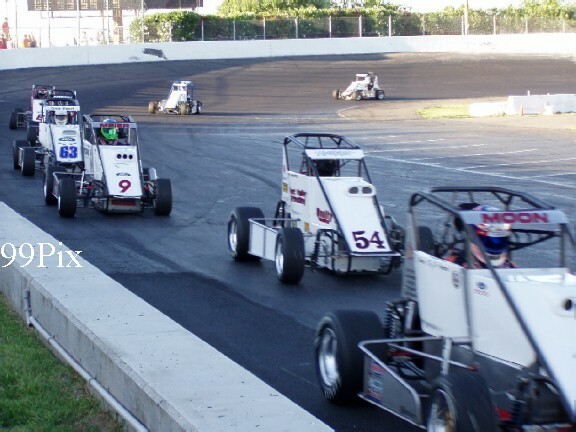 Graham Blackburn (Santa Cruz), driving the Miller Motorsports number 27, took third, Nathan McNeil (Oakdale) finished fourth and Bret Barney (Rhonert Park) came in fifth. 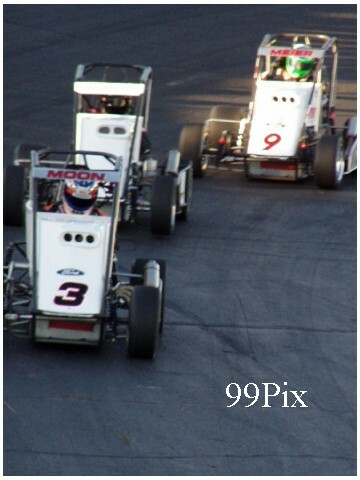 The USAC Ford Focus Midgets were back on the track for a main and a couple of dashes. Winning the main event was Benny Moon, second was Robbie Whitchurch, third was Jace Meier, fourth was Alex Harris and Chris Veach was fifth. 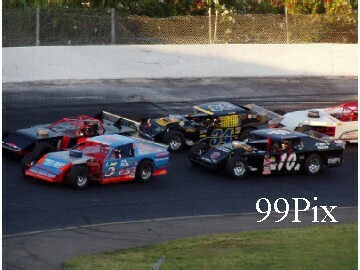 On Saturday, June 18 3-M will present the HAVOLINE Western Late Models, CL BRYANT ALSC, USAC FORD FOCUS Midgets, Pro-4 Trucks, Legends and California Mini Racing Association Mini Cups.